So, nail polish smells. Just in general. This is a pretty well accepted thing- “nail polish smell”, so the idea of perfumed nail polish is pretty interesting. 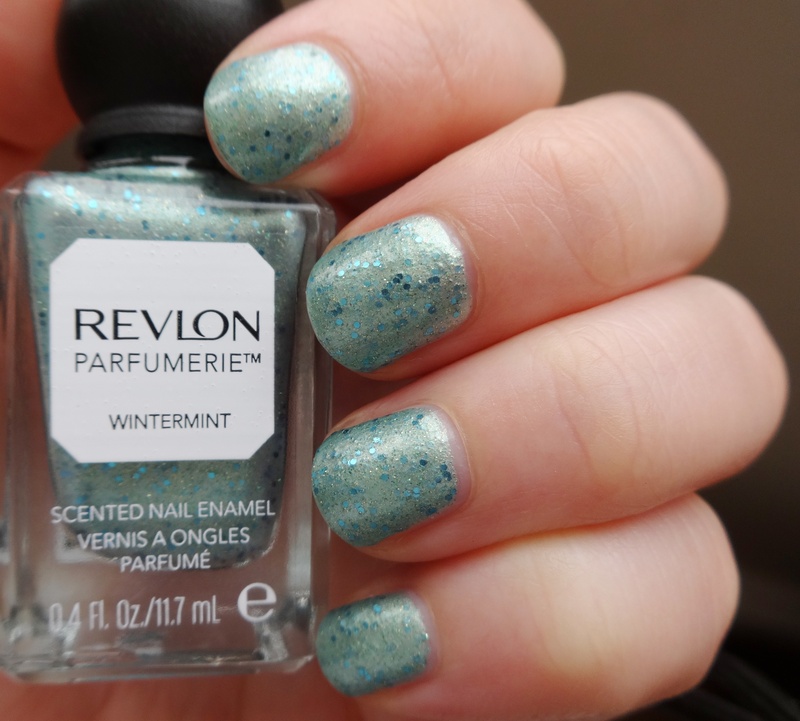 Recently, Revlon has released a pretty large selection of “Parfumerie” scented polishes, which include a variety of flowery smells, a beachy scent or two, and some odd birds (Italian Leather, Autumn Spice- both of which are super popular). You can check out the whole line at their site. I picked up the color/flavor “Wintermint”, a seafoamy green shimmer with gold microglitter and small turquoise hex glitters. This is three coats, with one layer of top coat. This was a bit of a topcoat eater, and even with one layer, it ended up being a bit textured and gritty. If this bugs you (it bugs me), or you really like that glassy look, you’re going to have to sacrifice some extra top coat to this polish. In certain lights, this looks more blue, but in some lights the gold really shines out. It really does looks good, wears nicely, and wasn’t as completely impossible to remove as I was expecting. Oh yeah- and it does smell nicely of sweet mint, even with top coat. When you are painting, it smells like normal nail polish, but you can really smell the mint scent as it begins to dry.The scent is very noticeable for the first two days: you’ll constantly catch whiffs of super sweet mint and be confused about where the candy is until you remember that it’s your nails. Which, depending on your outlook about candy, may or may not be disappointing. After three or four days, the scent kind of fades away (but it is still there if you get your nose really all up in your nails). 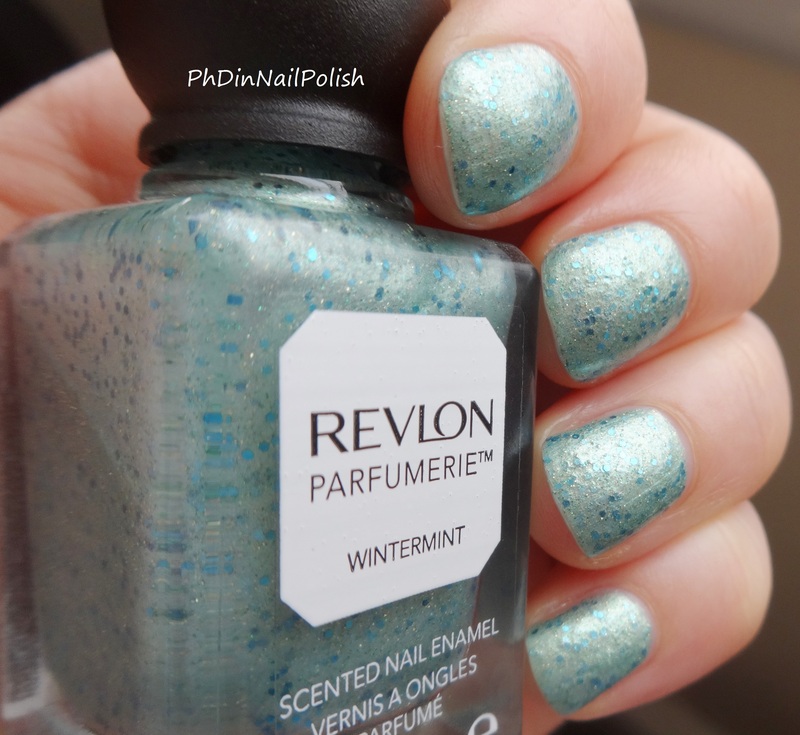 Luckily, since this guy is a Revlon polish, it is fairly easy to get your hands on! I’ve seen them in Target and a handful of drugstores (Walgreens, CVS).